The generosity from friends and family is always quite overwhelming at Christmas and although each present is so gratefully received there are usually a few items in particular that the Mini Mes just can't put down! Jamster had wanted a mobile phone for quite a while, and as a lot of his friends had recently received handsets I thought it was time to get him his own. I felt as though this make and model were ideal for his first and it was good value too at £89.95 sim free. I've set up a monthly contract so I don't need to worry about topping it up. These have been here, there and everywhere already! Jamster took them to my parent's on Boxing Day and to my sister's the day after to show everyone. He wears a set constantly and gives the other to whoever is willing to use it. Once switched on you don't need to press a button when you speak, like you would on standard walkie talkies, this is constant two way chat with a range of up to 30m so he was rather impressed, especially as he loves his action hero/secret agent movies. With 225 tricks to learn this will certainly keep Jamster occupied for some time. During the periods of time we have actually been at home over the past few days he has spent a lot of time in his room focusing on this kit and perfecting his new hobby. He has always really enjoyed watching Dynamo so he has had lots of fun already learning how to do magic himself. I'm looking forward to watching his performance in the near future. Jamster can play even more tricks on people with this rather large spider complete with home, much to his delight. He has placed it on the floor as an attempt to terrify me on several occasions and although it lights up and scurries along quite freakishly I'm usually quite prepared as his giggles are a give-away! This is a great set for anyone into beasts and bugs. At just £13.99 this is a good value game. It features LEGO characters and as it's multi-player it's ideal for siblings... although I've completed a few levels with Jamster already. It follows the story of the movies well and although it's fairly simple it's still entertaining. What was your child's favourite gift this year? What fab gifts! I am sure you have some very happy children! We have a Wild Pets Spider Habitat Playset in our house too, my partner's screamed a couple of times so far, so funny! These are such great presents! I'm always so bad at choosing them! So many great presents and great ideas! 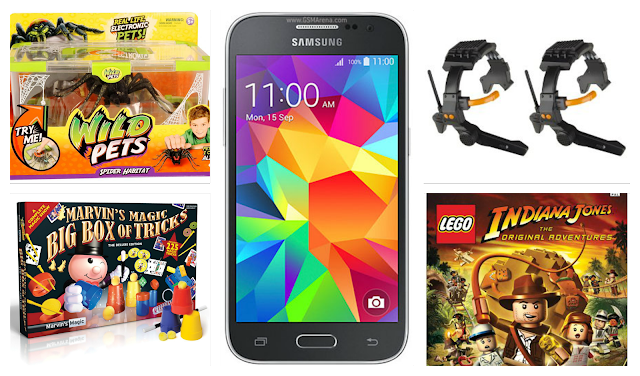 These are fabulous gift ideas that I'm sure any young boy would love! Love the gift idea thank you !